EXACTLY A month ago, in the auditorium of the newest campus of the University of the Philippines at Bonifacio Global City, an event of great historical significance took place—the first general assembly and forum of the newly organized Akademyang Filipino, the first Philippine academy of arts, sciences, and the professions. In other places, such academies have had somewhat more focused roles. The venerable Academie française is devoted to being the authority on the French language; the Taiwan-based Academia Sinica covers a broad range of disciplines but supports advanced research. In the United States, the National Academies of Sciences, Engineering, and Medicine is the collective name of the three honorific academies in those disciplines. Since its founding in 1863, these national academies have pledged “to marshal the energy and intellect of the nation’s critical thinkers to respond to policy challenges…. When faced with a complex question, we bring together experts from across disciplines to look at the evidence with fresh eyes and openness to insights from other fields. These study committees survey the landscape of relevant research, hold public meetings to gather information, and deliberate to reach consensus, which results in a shared understanding of what the evidence reveals and the best path forward.” Studies and advice by the National Academies have covered such diverse topics as fixing the Hubble telescope, preventing wrongful convictions, and preparing young Americans for careers in science and engineering. The Akademya’s 100-plus founding members—a roster that could grow as more names are vetted—were selected by an interim board composed of NA Frankie Jose, National Scientist Angel Alcala, former Ombudsman Conchita Carpio Morales, Senior Associate Justice Antonio Carpio, Sen. Sonny Angara, former Sen. Ramon Magsaysay Jr., Atty. Felipe Gozon, Dr. Lydia Echauz, Ms. Doris Magsaysay Ho, and myself. We also elected Justice Carpio Morales our chairperson, and NA Jose as Chairman Emeritus. Some easily recognizable faces at the launch included former UP President Emerlinda Roman, former Education Sec. Armin Luistro, former Foreign Affairs Sec. Delia Albert, former National Historical Commission Chair Maris Diokno, former Prime Minister Cesar Virata, historian Dr. Ricky Soler, Mapua University President Rey Vea, businessman Jack Ng, novelist Cristina Pantoja Hidalgo, sculptor Toym Imao, and Anvil Publishing chief Andrea Pasion-Flores. A smaller group had met less formally for the first time in February last year, when Sen. Ed Angara was still around and very much involved in getting the academy off the ground alongside NA Frankie Jose. It still called itself the “Academia Filipina” then, but later changed its name in deference to an existing Academia Filipina de la Lengua Española. This was the first but certainly not the last of our forums, and we intend to have several of these large assembly-type meetings every year for issues of great and general significance, concerning not just politics and business but also science and the arts. We need to create new interdisciplinary points of intersection and interaction. Our artists and scientists hardly ever get heard by our policy makers. With all due respect to the lawyers and the businessmen, they too might benefit from the insights of these other disciplines, so that we do not get mired in the kind of cynical pragmatism that drives too many of our decisions today, and remember to value such abstractions as beauty and logic. The dues we collect will help support a very small back room and also our future activities. Sponsorships are of course needed and welcome, for so long as they do not compromise the independence of our association. On that note I would like to thank, once again, aside from our speakers, our sponsors for the Akademyang Filipino event, including the UP College of Law, whose Dean, Fides Cordero-Tan, also happens to be the Executive Director of UP-BGC. I’d also like to thank the National Commission for Culture and the Arts, Sen. Jun Magsaysay, and other donors who prefer to remain anonymous for their assistance. My special thanks go to our Executive Director, Ms. Jette Jose Bergkamp, and my UP team from the Padayon Public Service Office and the Media and Public Relations Office. LAST WEEK’S piece on my “passion for the past” apparently struck a positive chord with my readers—including a couple of friends who also happen to be professional historians, the eminent professor Bernardita Churchill and my UP neighbor Maris Diokno, who’ll be returning to teaching this semester after her stint with the National Historical Commission. Both messaged me to say that they enjoyed my column (many thanks!) and to invite me to speak to a group of history enthusiasts or to a class about my obsession and my forays into collecting historical memorabilia (I will). To both friends, and to those who will be listening to me, I once again affirm that I am not a historian or a scholar. A true scholar of history will seek to palpate and to understand the full context of things—not just of objects but of actions, decisions, and ideas; he or she will be guided by some workable theory of human and social behavior, and a disciplined commitment to the truth; and the past could be important less for its own sake than as a window on the present and the future. I appreciate and respect all these considerations, which is why I know and acknowledge that I can’t live up to them, at least not at the moment. For now, my most honest self-description would be that of a scavenger (“fetishist” also comes to mind), not unlike a dog who drags in interesting objects off the street—sometimes gruesome, sometimes delightful. I rummage through other people’s leavings (as an impoverished grad student in the States, I happily went dumpster diving), finding and retrieving objects of wonder. The material object is my prize; whatever else it leads to—some story, some insight, some unforeseen discovery—is pure bonus. That’s applied to my vintage pens and books, some of which turned out to have been owned by famous or important persons. But some of my most interesting finds on eBay have involved the most common people and the most ordinary—and therefore the most plaintive and often poignant—revelations. This is no truer than in the letters I come across on eBay, likely seen by many as the leftovers of estate sales, after all the valuable furniture, silverware, and knick-knacks have been carted away. I’ll admit that reading them feels a little voyeuristic, because there’s nothing more intimate than seeing into someone’s heart and mind, even when it doesn’t involve endearments or estrangements. There were these letters, for example, which I saw last November, written by a teenager named J. R. Oyco (at least that’s what I can make of the signature, but I could be wrong) from Bacolod to Forrest J. Ackermann (1916-2008), whom sci-fi fans will recognize as one of the pioneers of the genre. What’s amazing is that the letters are from 1933-34, when Ackermann himself was no more than 18, so these were two teenagers chatting across the ocean in longhand about what today would be speculative fiction. “Three days ago,” Mr. Oyco writes, “I finished reading the April Astounding Stories and enjoyed the swell stories it had—from H. V. Brown’s cover to the advertisement on the last page…. As I noticed, Astounding was in the market for some years but stopped, and again covered the field just last October. However, from mere weird tales they published on that said issue, the editors, by the present time, have achieved a great if not astounding achievement by their thought-variant narratives. By publishing these kinds of stories, they give authors a chance to show their talents and imaginations and stimulate interesting reactions from the readers themselves.” Apparently Ackermann had responded to an earlier letter because J. R. thanks him for the gift of a magazine. These objects affirm, for me, that the past happened, and more than that, that the past will be remembered. It may not matter to me when I’m gone—which, in my darkest musings, could mean that I will no longer have any sense of “me” or of time itself—but it matters to me now, to know that our words and deeds bear consequences, and that we will all leave some trail behind. And so I should write and act with that trail aforethought—so someone, a century hence, will be happy to find a book I wrote, or some note I scribbled, and smile at the memory. I’M AN incorrigible pack rat; I keep restaurant receipts and bus tickets from the 1970s, business cards from associates long forgotten or even departed, and notes and memos from various points of my engagement with one bureaucracy or other. These odds and ends molder in a large wooden baul that sits in a corner of my office, a chest Beng and I bought for our daughter’s wedding but which somehow stayed with me (our unica hija Demi will still get that baul, contents and all, on one of her visits home from California). Other old letters I keep in a leather briefcase, itself now an artifact, a souvenir from my first trip to the US in 1980. I was rummaging through the papers in that chest and that briefcase a few weeks ago, looking for something I could contribute to the benefit auction we were holding for Writers’ Night, when I stumbled on some letters I’d received (and some I sent—I dutifully Xeroxed my outbound mail then) from writer-friends. The most interesting ones were those that opened a window on my friends’ minds as writers and as persons—as young men, really, on the road to emotional, intellectual, and artistic maturity. One of those friends I exchanged long letters with was the late Bienvenido “Boy” Noriega Jr., very probably our finest playwright, and something of a prodigy who headed the Policy Coordination Staff at the National Economic and Development Authority in his early 20s; Boy went to Harvard in 1978, when he was 26, for his master’s in Public Administration, but cross-enrolled in theater courses at the same time. Another was poet Fidelito Cortes, who beat me out to a Wallace Stegner fellowship at Stanford in the mid-1980s (and who made up for it by greeting me in San Francisco with the gift of a Stanford sweatshirt when it was my turn to come in 1986). I also wrote letters to film director Lino Brocka, who preferred to use the telephone to respond (quite often forgetting, when I was in Milwaukee, that it was 2 am when he was calling from Quezon City). 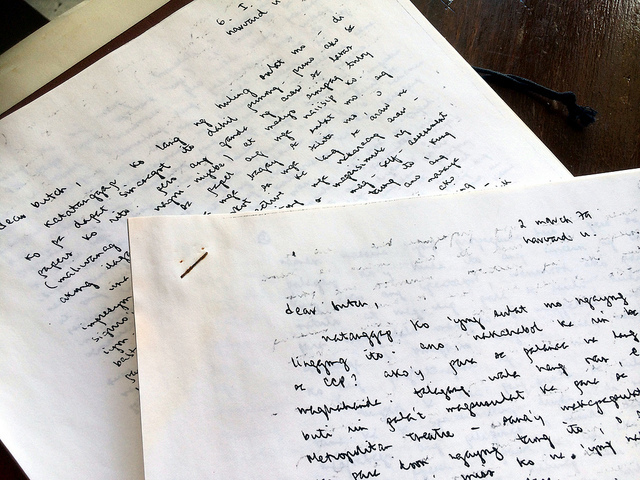 Boy always hand-wrote his letters in small, fine script; Lito, like myself, used a typewriter; our letters went on for pages and pages, reporting on what we were writing, seeing, and thinking at that time, aware that we were standing on the doorstep of our lives’ great labors. This week and next, let me share some excerpts from our exchanges, leaving aside more personal references. I’m translating Boy’s from the Filipino original. My drama course is the most exciting of all my subjects. We’re studying all the major dramatists. We’re done with Ibsen, Strindberg, Chekhov, Wilde, Shaw… Wagner, Dumas fils and Buchner, and soon to follow will be Brecht, Pirandello, Beckett, Miller, Williams, O’Neill, etc. The best for me are still Ibsen and Chekhov—Ibsen for characterization and Chekhov for his mastery of dramatic devices such as economy in dialogue, choice of moments, verbal counterpoint, and so on. You know, it’s only now that I’ve discovered how Chekhovian my [three-act play] Bayan-Bayanan is. When I get back home, I can return to it and give it a final revision because I know now how I can still tighten and improve it. One more thing I admire about Chekhov is his lifestyle—shy, pensive, self-assured. I don’t know if I can still write for the CCP [Literary Contest]—I’m too pressed for time. What about you, are you all set for this, or are you working on your Filmfest entry first? My dilemma in joining contests always seems to be that I worry about how to write my play in a way that the judge who’s in a hurry will grasp. If it isn’t well-made (meaning, it has a very clear plot), it could be hard to appreciate or to draw attention. I guess that if Chekhov joined our contests, he’d lose…. His style is so refined compared to mine. Once, for example, he was asked what the “character” of one of his characters was, and he answered, “He wears a yellow tie,” and everything was in that answer. What are the entries to the Manila Film Festival—are they any good? Have they started the songfest? These would be good to get into—I have a lot of ideas for songs, about country and love and life—but I need to look for a good composer and a good singer…. There must be many more good playwrights such as Sophocles, Shakespeare, Racine and Moliere, but I still don’t know them well enough. I’d like to understand them all—because I’d like to teach drama someday (as a sort of sideline in case I become a full-time writer). It looks like I keep looking to [Rolando] Tinio as a model—whatever is in my field, I’d like to know. …. The more I learn here, the more I’m aware that there’s so much I don’t know. The truth is, I need philosophy, psychology, and more to put everything together in my head. What I’m doing now is crash education. My letter’s getting awfully long. I’m just trying out the ideas I’ve been picking up. That’s because I don’t have any students yet. I remember when PETA asked us to give a lecture about our plays. I feel like I wasn’t able to say anything. The audience’s orientation was also so different. That will never happen to me again. I will also organize my ideas. …. This will be all for now, because I’m getting sleepy. It looks like both of us keep writing such long letters. I hope we’re not just repeating ourselves. But it seems to me that we’re progressing. About some of the points you raised in your letter—you’re right about speechwriting there. The Philippines or the world won’t change because of one speech. I’ve tired of this myself. The problem there is, every presidential speech has to be a speech to impress. It would be easier if it were just a speech to inform. Another problem is that we still lack in achievement and vision, so it’s really hard to impress. If there’s truly a lot to show, there wouldn’t be much need for talk, right? …. The finitude of everything probably remains debatable. Or maybe I’m just being optimistic—I suspect that man will always discover something to overcome natural forces…. In general, I think I’m still optimistic. Maybe this is because I believe there’s a God who guides our actions. The “meaning” of life probably just doesn’t manifest itself in its consequences (in its practical results) but in the way life is used. Could be in some small things (small acts of charity, love, etc.) that we sometimes fail to notice. …. There was a point in my brief life (before I turned 21) when I asked myself these things—what was the purpose of life? Why are people the way they are? And so on. Every now and then, I still raise the same questions, but I’m no longer dismayed, like I used to be. I’m no longer surprised, either…. When I come home, I’ll write some essays (I’m preparing my topics)—I’d like to be able to contribute to the field of thought. I have so many plans. Boy Noriega died of cancer in 1994 at 42; I was away on a writing fellowship in Scotland, working on what would become Penmanship and Other Stories, when I heard about it. I later put his letters to me together and gave copies of them to his family. Next week, some fun with Fidelito.